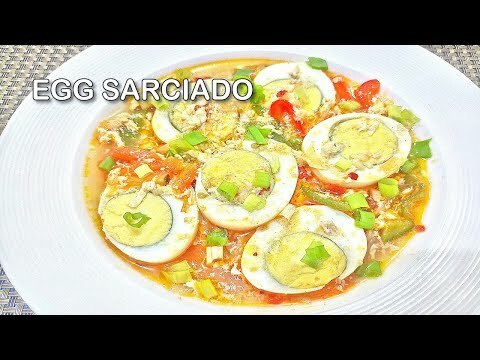 Egg Sarciado Recipe is a budget friendly Filipino dish and yet very delicious. This popular Filipino dish is usually done with fish (Fish Sarciado Recipe), but you can also use chicken, pork, and shrimp as the main ingredient. Let me give you a little background about this dish, Sarciado literally means “cooked with a thick sauce” in Tagalog, the word is derived from the Tagalog word “sarsa” that refers to a thick sauce which in turn comes from the Spanish word “salsa” which means sauce. Aside from the eggs, you will need onions, garlic, tomatoes and bell peppers, others add tomato sauce or tomato paste for a richer flavor, laurel leaf, salt and pepper as seasoning. Just carefully follow the easy to cook procedure below. Saute the onion, garlic, tomato, and bell peppers for 3 to 5 minutes. Pour-in the chicken (or vegetable) broth. Let boil. Pour-in the beaten egg. Stir until the egg is distributed. Continue to cook for 3 minutes more. Garnish with Scallions on top. Looks very interesting!! I LOVE eggs so I bet I’ll enjoy it!! My guy would make this disappear really fast,lol he loves eggs and often eats dishes like this. This looks amazing, I need to try it. I’d love to try this with chicken! We have chickens and get about a dozen eggs a day, so finding egg recipes is really nice. We will try this! Never heard of this dish till now, i’ve been missing out. i love eggs, this is perfect. This dish looks hearty and delish. Thanks for posting! This looks like such a good recipe to try. Im always looking for new recipes. This looks amazing. I will have to try to make it sometime.